As the summer flowers give way to the ones that’ll take us through autumn, it’s a good time to look back at how the gardens have been doing so far this year. It’s been quite tough keeping everything going, as we’ve only had two periods of rain several hours long since March, and that’s been it; so we’re having to water a lot more than we usually would to make sure there are always a couple of the bees’ favourite plants in flower right through the year. We should be looking forward to new plants coming into flower in a few weeks, but many of them are two to four weeks early – the Michaelmas daisies started flowering last week, in the first week of July! Most of the plants established last year are doing OK despite the drought, but this has been the year we trialled bedding plants for their usefulness to bees, and bedding plants seem to be the divas of the plant world – they need constant watering, dead-heading, feeding, and weeding around. With hindsight, they weren’t the best choice. Still, the echiums are settling in and providing bright blue colour in the beds, and welcome nectar for the bees – though nothing like as much as their wild equivalent in the second bed down from the car park, where we have two Viper’s Bugloss (Echium vulgare) plants, tall spikes of smallish blue flowers, covered in bees most of the time. The ‘Disco’ French marigolds provide great bursts of bright orange – but then, so do the California poppies they’ve largely displaced, and while there have been a lot of bees on the California poppies, there haven’t been many bees on the marigolds. The mignonettes are finally growing well and flowering, and they do smell sweet, but it’s taken a lot of watering and TLC to get them established, and we have limited resources. So while they’ve provided a nice change this year, I don’t think we’ll be repeating the experiment. We’ll need to find something else for the children from Mentmore Road Under 5’s to plant next year – they thoroughly enjoy planting things out, and watching them grow and flower! Last week some of the children had fun picking the peas they’d planted a couple of months ago, and eating them straight from the pod, and they also lifted some of their carrots to see how they were doing (fine, but nowhere near ready). That didn’t seem to bother them at all – they still found it magical that they could dig out little green feathery plants and find a real carrot underneath, even if it was only 10cm long! Next year we’re thinking of getting them to plant early potatoes so they can dig up some buried treasure well before the end of term; we always have to race a bit to get them something to harvest before they break up for the summer. A couple of weeks ago they planted some annuals for the autumn (sunflowers and Cosmos) and a few foxglove and hollyhock seedlings, so that should give them something to watch grow next term. I’m not sure they believed me when I told them the tiny hollyhock seedlings would grow into plants like the ones twice their height in the next bed. The Leighton Buzzard Observer carried a nice article on June 20th about the cooperation between the preschool and the regular team. The regular team have been doing more dead-heading and less weeding as our earlier work has begun to pay off, especially as we were able to mulch the ground with almost-ready leaf mould after we’d weeded it. The local blackbirds throw the leaf mould around too much – often, our first task of the day is to brush the leaf mould off the paths and back into the beds. Leaf mould usually takes a couple of years to rot down completely, and what we’re using isn’t quite a year old, so we should have less mobile mulch in future. We’re also thinking ahead to autumn, when we’ll be able to sort out some compost from the bins round the back, and top it with leaf mould to keep weed seeds from germinating. We’ll also be lifting all the dead plants in the wild flower bed – they’ve gone over much faster than usual, and have grown much less than usual too. This is almost certainly due to the drought – we watered copiously until a couple of weeks ago, when we decided we were just wasting water by pouring it onto the ground to no real effect, as wild flowers don’t seem to respond as well as garden plants and all the annuals were clearly dying back much earlier than usual. 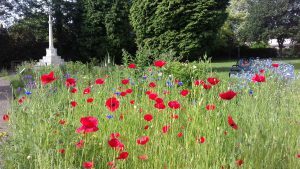 So as usual we’ll start the gardening year in September by collecting seed from the poppies to sow once we’ve turned the soil and added compost. This entry was posted in Uncategorized and tagged bee magnet flowers, drought, leaf mould, local preschool, mulching, watering on July 10, 2017 by Pippa Sandford. It’s been a long time since the last blog post, mainly because some of the team have been helping out at the Pocket Park by Leighton Buzzard station, and with the heatwave and drought of the last couple of months, we’ve been kept busier than usual trying to keep all the new plants sufficiently watered. We’ve even broken our usual rule of not using a hose, because one good soaking followed by mulching with leaf mould lasts a lot longer than just watering odd plants occasionally. We really need rain! 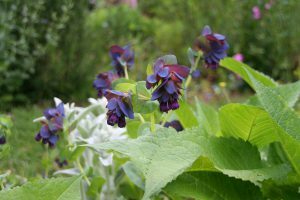 The first of the flowers that are particularly attractive to bees is honeywort (Cerinthe major ‘Purpurascens’), an unusual annual which flowers for a long time between April and June, and self-seeds but never becomes invasive. It has bluish-green leaves with purple bracts and hanging bell-shaped flowers, it produces lots of nectar, and the bees just love it. 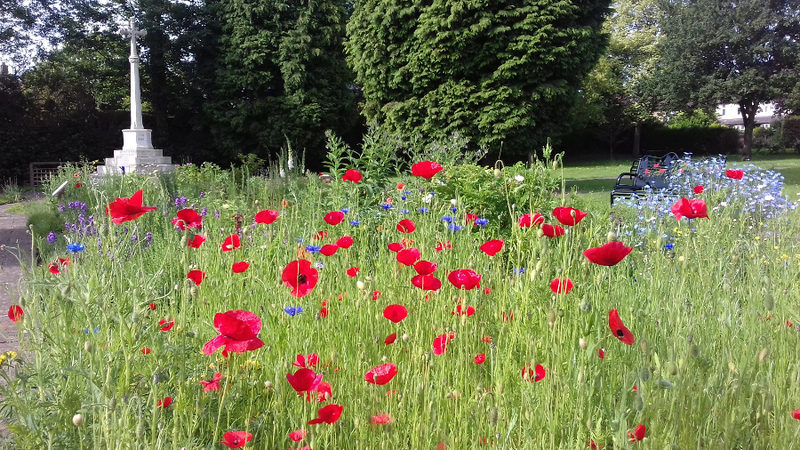 We have some seed if anyone wants to start some off in their garden – just contact us via the usual email, or Comment below. Another flower bees really like is Geranium macrorrhizum, which will eventually make quite a carpet of fresh-looking, slightly bluish leaves, with pink flowers for a few weeks between April and June, depending on the weather. The flowers are typical cranesbill geraniums, with the long, beak-shaped seedheads that give the plant family its common name. It’s a very useful plant that grows happily in full sun or quite deep shade. We grow two other hardy geraniums here, both of which bees love – ‘Rozanne’, in the middle of the second bed down from the car park (blue flowers with a white centre; flowers most of the summer from mid-May, here; and should eventually make a plant about 80cm x 80 cm), and ‘Kashmir White’ in two or three of the other beds, which has graceful stems with bright green foliage, and white flowers with thin red stripes in them. It spreads well, but isn’t invasive. with the inevitable visiting bumble bee in at least two of the flowers here. This entry was posted in Uncategorized and tagged bee magnet flowers on July 9, 2017 by Pippa Sandford.